At an Occupy Wall Street meeting in midtown Manhattan on December 20th, a debate broke out about the general assemblies (hereafter, GAs)—the core decision-making forums of the movement and its most visible embodiment of direct democracy. The meeting was the second of its kind devoted to exploring the idea of a city-wide general assembly. About 80 people attended, including members of several OWS working groups and GAs across the city, of which there are now about a dozen. While some people seemed dissatisfied with the GAs, and perhaps even ready to dispense with them, others appeared intent on popularizing them even more. The discussion reminded me that this movement is growing and deepening its ties with local neighborhoods—yet as it does, it is encountering the challenge of how to accommodate new communities and support existing organizations that share its goals. While this challenge is still fairly new for OWS, it is one that has been faced and overcome by other movements before. As a participant-observer who wants the Occupy movement to flourish, this strikes me as an appropriate moment to look back at another social movement that promoted consultation and consenus-building. In the 1980s, South Africa’s United Democratic Front (UDF) helped to end apartheid by empowering existing community-based organizations and developing the leadership capacities of local leaders, some of whom had little or no prior experience as activists. Notably, the UDF inspired and mobilized diverse affiliates without trying to impose one political framework upon them. At this particular juncture, when OWS’s New York City-based leaders appear divided over the question of how much emphasis to place on the GAs and on the general ethos of consensus-based politics, the UDF’s victories seem instructive. The structures for decision-making within the UDF may have often seemed tedious, but they taught us the importance of consensus politics and participatory democracy. … The regular debate within the UDF on democracy and accountability, the insistence that unaccountable leaders be recalled and the importance attached to criticism and self-criticism served to weaken any potential autocratic tendencies in the “new” South Africa. Some students of South African politics might argue that the UDF did not go far enough to weaken “autocratic tendencies.” The current ruling African National Congress (ANC) party has launched salvos against free speech while continuing to rely on economic policies that have entrenched the privilege of elites rather than creating the kind of equitable society many UDF supporters envisioned in the 1980s. Nevertheless, the UDF is worth revisiting. For OWS, it suggests that a flexible, open, decentralized approach, one that allows extant groups to affiliate without radically altering their language or abandoning their existing decision-making processes in favor of new ones—namely, those of the GAs—can still succeed at dismantling oppressive systems. Thinking about the challenges now facing OWS, it seems significant that the UDF’s malleable framework and its emphasis on empowering grassroots organizations helped it become resilient. When visible activists were imprisoned and large public meetings prohibited, the organization rebounded. Indeed, it found ways to use arrests and state repression to its advantage. Some of the UDF’s most successful campaigns, such as consumer boycotts of white-owned stores in the Eastern Cape, were organized with minimal oversight and sometimes no discussion by the national executive. Supple regional networks enabled ideas to be rapidly shared and decisions to be made on the spot. Importantly, identifying with the UDF’s “equal rights for all” slogans did not require structural symmetries in terms of organizational processes. 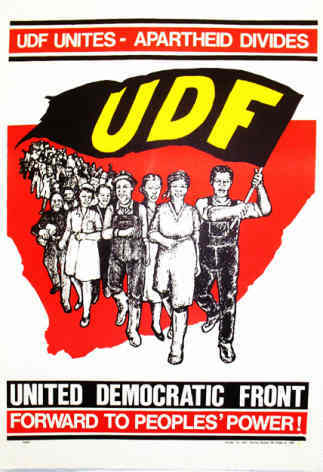 The UDF shall strive towards the realisation of a non-racial, democratic and unfragmented South Africa, and to this end shall: 3.2 act as a coordinating body for progressive community, social, education and other such organisations which subscribe to democratic principles; 3.4 articulate the social and political aspirations of the affiliates of the UDF and their members [emphasis mine]. In this way, the UDF worked toward one clear negative goal (ending apartheid) and one clear positive goal (a democratic society). Using what Tom Lodge has called a “capacious ideological umbrella,” the UDF built a national liberation front that easily sheltered divergent groups which might otherwise never have coalesced. Meetings provided liberating spaces complete with camaraderie, rousing speeches, and forms of racial and gender equity as well as autonomous self-rule. Absent were top-down attempts to solicit agreement about what self-governance or social responsibility in South Africa ought to look like or what exactly the state should become. Like the Occupy movement, the linkages between UDF and the labor unions varied by region and by union. Unlike the Occupy movement, however (at least thus far), the UDF successfully drew distinctive local organizations into its fold. Its sprawling tent accommodated civic organizations, street committees, black student groups, rent-payers associations, ANC supporters, Black Consciousness thinkers, socialists, social democrats, and an upwardly mobile black urban middle class. White university students also assisted the movement by printing pamphlets and making banners, even with constant police surveillance and infiltration of student of groups by the security police. During a small-group breakout session at the Occupy Wall Street meeting mentioned above, I heard a well-known Brooklyn-based strategist argue that “every revolutionary moment has some kind of political structure.” He seemed to be suggesting that modeling and promoting the GAs ought to remain a major, if not the major, objective of Occupy. Although all historical comparisons are suspect since no two movements evolve in analogous conditions, OWS must learn from the past if it is to succeed. Here the lesson seems to be that decentralization, or what Molefe called “trailing behind the masses,” can still be revolutionary if it unleashes people’s latent desires to transform society. Perhaps OWS should strive for UDF-like flexibility. Without abandoning the GAs altogether, this may be a critical moment for the Occupy movement to think beyond the GAs and to find ways to stretch itself to become more inclusive of other kinds of organizations while also becoming more clear about its positive, constructive goals for the future. For real grassroots organisation in South Africa take a look at the work of Moses Mayekiso and the Alexandra Action Committee.